Earlier today, Insomanic released a new trailer for the upcoming Spider-Man title for the PlayStation 4. Except, I’m a bit confused by it all. You see, it’s called the “Gameplay Launch Trailer”, it says it right in the trailer image. Which is a bit odd as the game doesn’t launch for another month. So it’s a tad too early for launch trailers, don’t you think Insomanic. That aside, this is an amazing trailer. More so when you release that all of the footage in this trailer is actual gameplay. Yep, there’s no CGI here. This is exactly what you’ll get once you start playing this on your PlayStation 4 (and Pro). It’s freaking kickass (can I say that?) watching Spidey swing through the skies, speeding across the streets with just an inch between him and them. Then the part where he jumps through the car, kicking the driver out and flips onto the top. Tell me that doesn’t have you geeking out, even if it’s a little bit. I’m still confused, however, to the relationship that Miles and Spidey have. In the comics, they know each other as Spider-man. I suppose we’ll find that out and more, once the game is released. Insomanic has done Spider-Man justice with this game. Very similar to what Rocksteady did for the Batman Arkham titles and those were some of the best superhero games ever. In fact, all this trailer did was make me wish that September was already here. But then again, that was probably the entire point and if so, good job Insomanic. I’m already throwing my money at my monitor. Please take it. 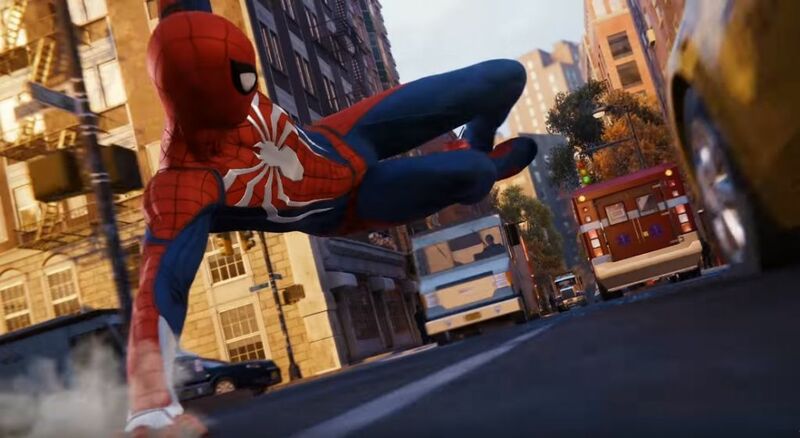 Spider-Man will be released exclusively on the PlayStation 4 this September 7, 2018.